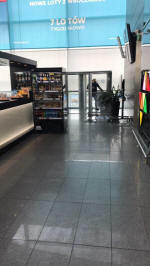 There are smoking facilities inside the terminal. Update and photos below from Drifa A. on the 7th Feb 2019. I confirm smoking area in Wroclaw Poland. Its a cabin that holds about 8-10 people. The bar in front is much bigger and smoking is not allowed in the bar. 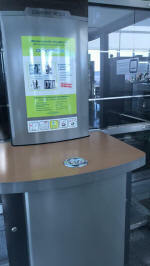 Smoking area after security check is located near Gate Bar. Feedback from Volodymyr A. on the 16th Aug 2018. 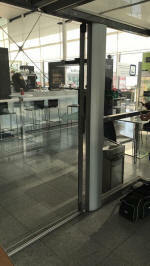 The smoking cabin at Wrocław airport is located next to Gate 1/2 behind the Gate Bar! Karsten B. sent this feedback on the 18th July 2018. 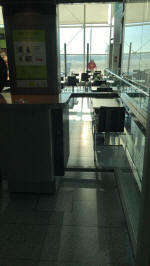 Unconfirmed feedback from Tommy G. - There is a smoking cabin at Wroclaw airport in Poland at the Gate. Bar fits around 8 people. Confirmation needed. The lounge has a smoking area. You have to pay to access.